Eyebrows are a big part of your beauty your entire appearance can change if your brows get thin. my experience hair loss is a condition that can affect any area of the body eyebrows will be lost hair by a variety of situations. Thinning eyebrows can be a common especially over-plucking so you should never over pluck your eyebrows, another common reason is ageing eyebrows usually start thinning when body getting older and you can get upset for thinning eyebrows, eyebrows are a major feature of your face beauty, so it’s important you will prevent browline. If you want perfectly maintained eyebrows, that may be in your hand you probably keep regular maintenance make sure your eyebrows exactly look how you want them. Remember that the natural way is always the safest way, and it can usually create impressive result if you want to avoid losing your eyebrow then you should consider trying these natural remedies to restore growth. 1. Take a clean mixing bowl. 2. Mustard oil castor oil and coconut oil mix well add garlic clove with peel and put a small cut in garlic center. 3. Pour the mixture in a glass jar with air-tight lid and store in a cool, dark place for seven days you can never use this mixture for seven days. 4. After seven days apply it daily and put the jar on your dressing table. 1. Apply a thin coat on the eyebrow with a cotton applicator. 2. When you first apply it, it can feel a bit greasy, but it usually absorbs within a minute. 3. Massage your fingertips massaging improves the blood circulation, which is very effective. 5. Next morning rinse with lukewarm water. 6. Continue this for a few months, and you can notice the difference. 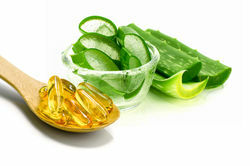 Vitamin E is a powerful antioxidant, you can find it easier to maintain thickens hair. 1. Take one tablespoon of aloe vera gel. 2. Vitamin E oil one teaspoon. 3. Mix it make a past. 4. Take a smooth past of aloe vera and vitamin E and massage your eyebrows gently with your fingertips. 6. Rinse with lukewarm water the next morning. 7. You can do this every night and improve your eyebrow growth. 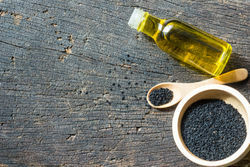 Black seed oil plays an important role in the treatment of thin eyebrows helps strengthen hair, oil also good to prevent hair fall. 1. Massage the eyebrow area with a small amount of black seed oil. 3. Next morning wash with lukewarm water. 4. Repeat this daily and see magical result.